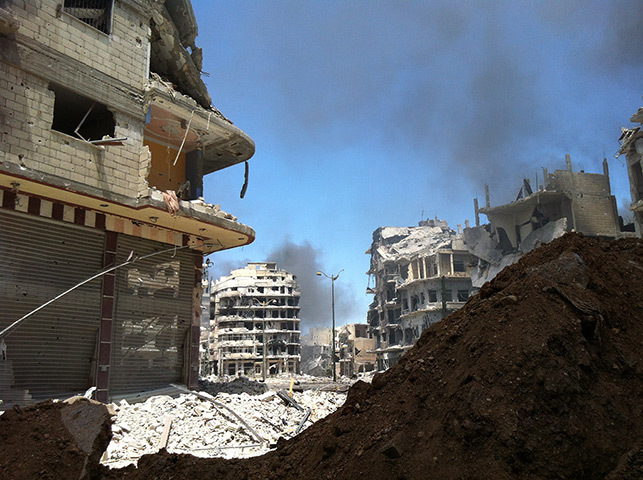 Central Homs in July 2013. Patrick Cockburn for The Independent has been the only Western journalist in Homs during a bout of new violence. Homs was a key city in the initial rebellion and has seen constant shelling- hundreds of thousands are displaced and trying to avoid the fighting. Swaths of the city are a ruin (I posted a picture of the destroyed streets in the December snow). marks of total destruction are everywhere since this is one of Homs’s “ghost districts” where the buildings have been torn apart by shell fire and their walls are pock-marked with bullets so they look as if they had been gnawed by enormous rats. Where buildings survive, their doorways and windows are boarded up and they look abandoned. 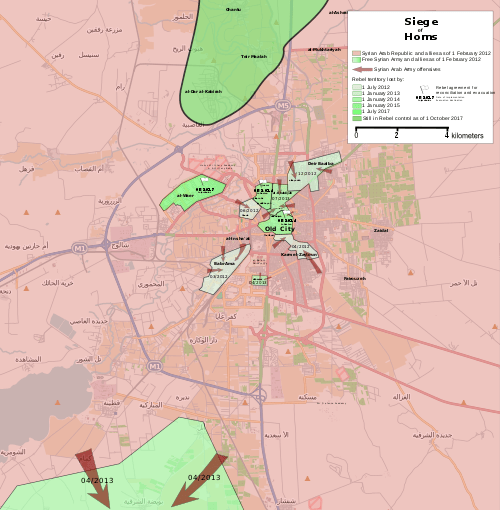 The Syrian Army looks like they are close to defeating the last rebel pockets in Homs- ~400,000 civilians are in the rebel districts, causing aid disruptions. The Army obviously doesn’t want to feed armed rebels, and it’s difficult to feed just noncombatants. Here is the January 2014 situation in Homs. Red is the Syrian government, Green is the opposition. Conflict between the government and rebels exists all over the country. A talented young American has produced some maps of Aleppo that show how entrenched and divided the city is- the most important in Syria outside of Damascus. Time flies- and sometimes we can forget how long this conflict has been going on. These rebel pockets in Homs have existed for almost three years- the American involvement in World War II was less than four. It is carnage, and a civil war that each day has more and more sides fighting amongst each other. 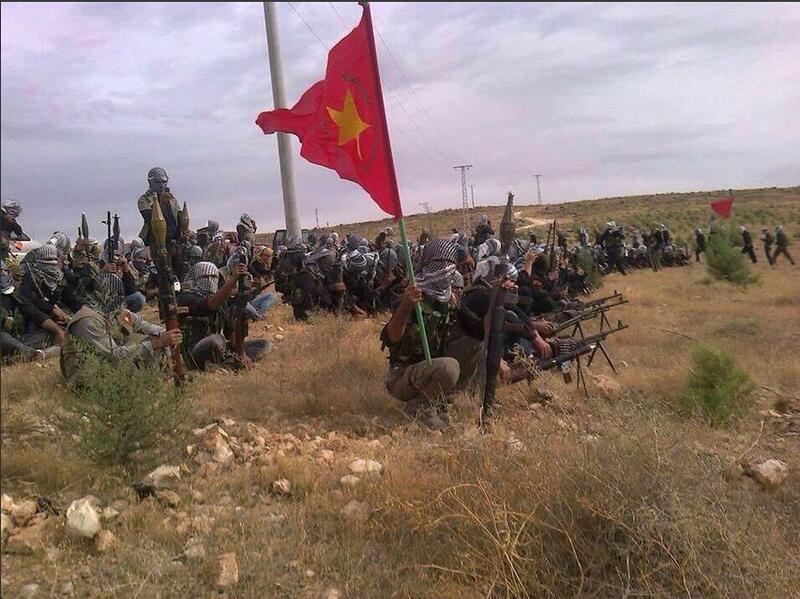 It is tough to speak of an “opposition” since some groups oppose the government and the rebels equally- the Kurds control a large amount of territory and mostly fight al-Qaeda-aligned groups, who in turn fight other rebel groups as well as the government. Over three million refugees– more than 1/8th the pre-war population. Don’t forget about the toll- more than those dead and wounded. It is immense. The Kurds in Syria have declared an autonomous region in the northern and eastern parts of the country where they have large populations. The announcement comes on the heels of battle successes against Jabhat al-Nusra and the Islamic State of Iraq and the Levant (ISIS), among the most powerful of the myriad homegrown and foreign forces fighting the Assad regime. 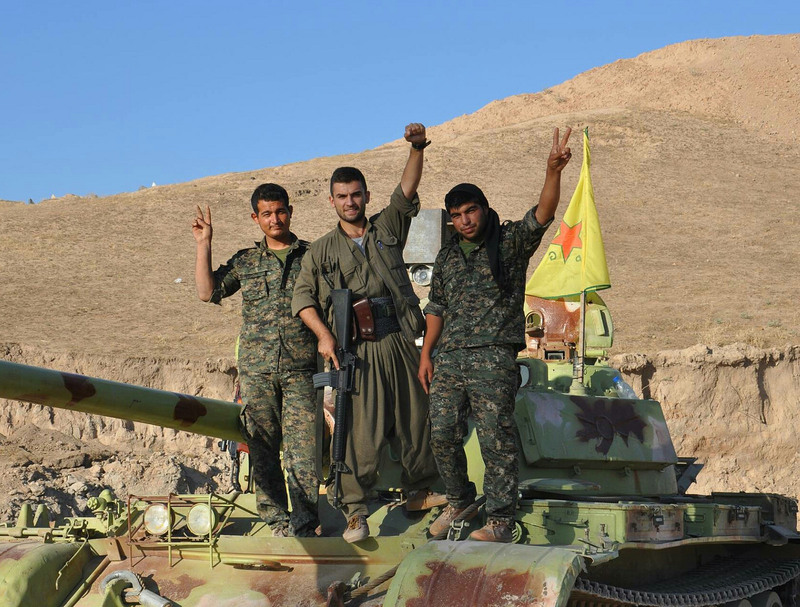 Since the latest fighting between the Syrian Kurds and Al Qaeda affiliates broke out in July, the dominant Kurdish organization, the Democratic Union Party (PYD), has used its battle successes to burnish its image among Kurds and consolidate its hold over the region. With a population of somewhere between 30 and 40 million, the Kurds are among the largest people to not have their own sovereign state. Saddam Hussein launched a bloody campaign against the Kurds in the northern portion of Iraq, after they sided with Iran in the Iran-Iraq War that lasted through most of the 1980s. Towards the end of the conflict in 1988 a large-scale gas attack killed several thousand people. 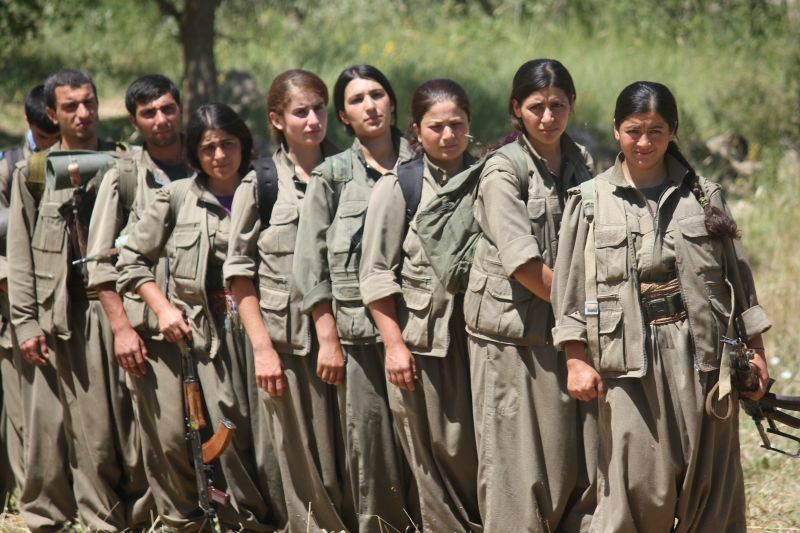 A large number of Kurds also live in southern Turkey, where the far-left Kurdistan Workers’ Party (PKK) fought a long conflict for independence, which stopped earlier this year after a unilateral ceasefire (though the conflict may get hot again, over Syria). The PYD draws a lot of support from the PKK, and a lot of material support from the autonomous Iraqi Kurdistan, which has a relative level of stability and economic prosperity. Moderate rebels may fear or despise the al-Qaeda-linked foreign fighters, but their mutual hatred of of the ruling regime always encourages cooperation as much as division. Kurds may be ambivalent to Assad, but need support to keep their territory together and keep connections to other groups in other countries open. A couple months ago, when Western intervention seemed obvious, I attempted to draw a diagram of all the nations, governments, factions, militias, and coalitions in the Syrian conflict. Ultimately my piece of paper was a complete mess- and I know I left out a bunch of key and secondary players. The conflict is being fought until one or more sides is ground into dust, and the desperation brings an aggressive, merciless politics along with it. In some ways, this is just the latest chapter in the Kurdish story- one of conflict and separation that predates the Syrian civil war by a long, long long time. Author Andrew MackayPosted on September 8, 2013 Categories Conflict, PoliticsTags Assad, conflict, Hezbollah, intervention, kurds, lebanon, russia, shite, sunni, syria, united states, warLeave a comment on Neat. Plausible. Wrong.